OK, this is guy is uncle Ralph, he is from US by no doubt when looking at the picture. Uncle Ralph is a slick guy, confident in style for sure. Harley watch fob, leather spots and jewels on his nifty riding cuffs, leggings to avoid his whool breeches getting messed up if his Harley "god forbid" should spill any oil from its engine, and some stylish googles to protect his eyes. I seriously doubt he could possible keep his hat on when at speed, but you newer know whit uncle Ralph, do you? Uncle`s hog is a 61" (1000cc, count the exhaust pocket cooling fins, remember?) Harley 1926-27 (28 or 29 would have different oilpump), original Harley cushion passanger seat, and its sporting some real cool wheel covers. 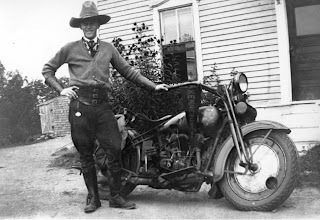 Uncle Ralph is a proud member of the Kennebunk Mc, a bounch of likeminded fellas always ready for a spin. If I`m to blame Ralph for any, this would be he have shown lack of respect when traveling in populated areas leaving his muffler cut out wide open (note the heel lever pointing upwards). Ehrr saved by the bell, just came to think about that the cut out is working the other way, sorry Ralph. Great photo- I'd like to use it for a newsletter article. DO you have a higher rez version? Where did u git it?